Anyone who listens to AAC audio will want to upgrade to iTunes 4.0.1, since it fixes a playback problem that existed in version 4.0. But you may have become fond of iTunes 4's Internet sharing features, which, as I wrote yesterday, are no more. The solution? Keep both versions -- they'll coexist on your hard drive. Before installing version 4.0.1, simply drag the iTunes application icon out of the Applications folder and into a different folder. Then install the 4.0.1 update. When you want Internet sharing, simply launch version 4.0.
iTunes 4.0.1 Thwarts Music Pirates. Or Does It? A genie is awfully hard to put back into a bottle. Yesterday, Apple released iTunes 4.0.1, a minor update that is causing a major uproar -- at least among music lovers who wear eye patches. iTunes 4.0.1 removes the ability to share your music over the Internet. The "Connect to Shared Music" command is no more, and if you attempt to connect to a shared library using a site such as ShareiTunes, your browser displays an error message. In iTunes 4.0.1, music sharing is back where Apple claims it was intended it to be all along: on your own local network. It's hard to take Apple's claim seriously, given that Internet sharing was built into iTunes 4. But we aren't here to question claims, at least not now. Let's focus instead on what iTunes 4.0.1 does and does not do. - Throw a wrench into the works of iTunes sharing portals such as ShareiTunes and iTuneShare. If the operators of these sites had visions of hitching a ride to fame and fortune through iTunes sharing, it's time for them to revisit their plans. See also Shawn Fanning. - Fix some audio-distortion and other playback problems that could occur when playing back AAC-encoded files. (The problem was most likely to occur when you used iTunes audio-processing features such as the equalizer.) There's some genuinely good news. And finally, there's this: In one way, iTunes 4.0.1 makes it easier to locate the address of a shared iTunes library. As I wrote in a previous dispatch, iTunes sharing portals cloak the address of a shared library in order to keep you from pecking the address into a theft utility such as iTunesDL. However, once you install iTunes 4.0.1, your browser no longer knows how to handle the "daap://" specifier that iTunes 4.0 used. What happens next? Internet Explorer displays an error message -- and the message contains the Internet address of the shared library. So much for cloaking. In the end, Apple did the right thing by disabling iTunes Internet sharing. More to the point, it did the necessary thing -- it's got to be hard to get a skittish recording industry to sign on your new music service when your software is allowing a small minority of users to steal music. The demise of sharing is lamentable but understandable. And the genie is still out of the bottle. It's high time I turned down the volume in iTunes and paid some attention to iPhoto. I spent some time organizing Memorial Day photos over the weekend, and I encountered a problem that deserves some attention. As I discuss in The Macintosh iLife, iPhoto teams up nicely with Adobe Photoshop and Photoshop Elements. If you never use iPhoto's built-in editing features, you can use iPhoto's Preferences command to automatically open an image in one these programs when you double-click it for editing. Or, if you divide your editing time between iPhoto and Photoshop, just do what I do: When you want to edit a photo in Photoshop, simply drag its iPhoto thumbnail image to the Photoshop icon in your dock. When you finish editing an image in an external editor, iPhoto is supposed to update its version of the photo to match your edits. But for some wacky reason, this doesn't always happen: iPhoto may continue to display the old version of the photo. 1. After you've edited and saved the photo in Photoshop, return to iPhoto. Be sure the photo is still selected, then click iPhoto's Edit button. 2. Use one of iPhoto's editing tools to make some change to the photo. For example, use the Crop tool to do some cropping. Don't worry about doing a great job -- you'll be undoing your work in the next step. 3. After making a change to the photo, choose Undo from iPhoto's Edit menu. 4. Switch to iPhoto's Organize mode by clicking the Organize button. Presto! The thumbnail should now reflect the edits you made in Photoshop. As this Apple Knowledge Base article shows, this problem has been around since iPhoto 1.0. Here's hoping Apple fixes it in a future version. Looking for a way to catalog your videotapes? Check out FootTrack, a new, $29 utility from T-Squared Software. FootTrack is short for "Footage Tracker," and T-Squared describes the program as "iPhoto for video." The description isn't far from the mark. With FootTrack, you can import, catalog, and search video clips. The program displays small, thumbnail images of each clip, and you can assign names to the clips for later searching. The current release of FootTrack requires that you first import your video using iMovie. (As noted below, I'm hoping future versions will be able to import directly from a camcorder.) Once that's done, switch to FootTrack and create a new "tape," which is roughly analogous to an iPhoto album. Because DV video inhales disk space, FootTrack enables you to compress the video for archiving. If you have QuickTime 6 installed, FootTrack compresses in MPEG-4 format. According to T-Squared Software, 60 minutes' worth of DV video will compress to a lowly 180MB. FootTrack looks like a good solution for a common problem: You have dozens of videotapes for which you'd like a scene-by-scene catalog, but you don't have the storage space to capture and keep every scene. Catalog the tapes with iMovie and FootTrack, compress the clips, then throw away the DV files that iMovie captured. You can even print a "contact sheet" that shows thumbnail images of each clip. There's room for improvement in FootTrack. As I've mentioned, I'd like to see the program import video directly from a camcorder, rather than requiring you to use iMovie first. Also welcome would be a feature that automatically recaptures DV versions of scenes whose original footage you discarded. That way, you could keep your compressed versions for cataloging, and then quickly recapture scenes that you wanted to use in a project. But for a version 1 release, FootTrack does a lot and does it reasonably well. Check it out. One of the few things that I miss about having a digital music library is the sense of a thing -- the ability to hold a physical package and look at it as music plays. A very cool and very free utility, the cleverly named Clutter, has brought some measure of that back to me. And it puts iTunes 4's new album-artwork feature to work in a genuinely useful way. Clutter displays a CD's artwork in a "Now Playing" window and in the Mac OS X dock. But here's the slick part: drag the artwork from the Now Playing window on to your desktop, and Clutter creates a small button containing the artwork image. Double-click that button, and the CD begins playing back. Having a party? 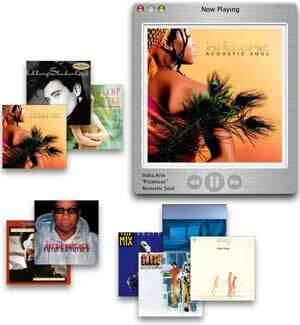 Create a few on-screen stacks of your favorite CDs and let folks riffle through them. Have a few favorite discs? Stack them on your desktop, where they're just a couple of clicks away. Oh, and if you don't have the artwork for a CD? Clutter will retrieve it from Amazon.com, and you can assign it the CD's tracks by simply choosing a command. Clutter gives you a new way to look at your music. Highly recommended. Music is harder to steal if you can't find out where it is. That's apparently the thinking behind some changes I've noticed at two iTunes sharing portals, ShareiTunes and iTuneShare. Last week, I wrote about how it's possible to use these sites together with free utilities to download -- that is, steal -- music from other users' shared iTunes libraries. The process was simple: use the site to find the address of a shared iTunes library, then paste that address into a program such as iTunesDL. It isn't quite so easy anymore. I learned this when I received an email from a reader: "I read your article and how you went to ShareiTunes and then Control-clicked to copy the URL address to paste into iTunesDL. For the life of me, I cannot get my iMac to get the URL address." Curious, I returned to ShareiTunes to try the technique. And indeed, it no longer works. ShareiTunes and iTuneShare are now "cloaking" the address of shared iTunes libraries: they hide it in a way that prevents would-be music pirates from easily copying the address into the likes of iTunesDL. And I'm betting the reason has something to do with a lawyer. Here's the deal. The recording industry can't go after all those iTunes users who have shared their music libraries. After all, the sharing feature is intended for music streaming, not downloading. However, the industry could conceivably pursue sites that publish lists of shared libraries -- sites like ShareiTunes and iTuneShare. But even this seems to be a stretch. These sharing portals aren't advocating piracy -- they're simply pointing to people who are using a built-in feature of iTunes. So it's a stretch, but when it comes to stretching, a lawyer can be more limber than a gymnast. You don't have to have a valid legal argument to bully a small site into shutting down. Of course, no protection is perfect. It took me about 37 seconds to circumvent the URL cloaking and find the addresses of shared libraries. I won't describe the steps here because, apart from stealing music, there's no reason you'd want to do this. But it is possible, and it isn't hard. Even if iTunes sharing portals were to vanish tomorrow, the theft-via-iTunes genie is out of the bottle. Music thieves will always be able to share URLs via chat rooms and other mechanisms. So what's the recording industry's best weapon against piracy? It already exists. It's called the iTunes Music Store. Live in the San Francisco Bay Area? Let's get together next Tuesday. I'll be speaking at the North Coast Mac User's Group, which meets from 7-9 p.m. in Rohnert Park. This is a large, vibrant group, and Tuesday's meeting promises to be a fun one. I'll be talking about iLife (naturally! ), with a focus on iTunes 4 and some of the controversies that are swirling around its sharing features. Live in New York City? Let's get together on June 12. In cooperation with Apple and J&R Music and Computer World, we at Avondale Media are bringing our red-hot iDay 2003 seminar to Manhattan's New Yorker Hotel. Check back soon for more details on iDay 2003, a full day of digital discovery hosted by yours truly. I suppose it had to happen. There are now programs that enable you to download -- that's download, not just stream -- music that other iTunes users are sharing through iTunes 4. The programs are called iTunesDL and iSlurp, the latter debuting today in a crude beta form. I tried them. They work. First, I went to ShareiTunes to find some shared libraries. When I found a library that looked interesting, I Control-clicked its link to copy its URL to the Mac's Clipboard. Next, I switched to iTunesDL and iSlurp and pasted the URL in. My first few attempts were unsuccessful. Then I tried deleting the "daap://" specifier from the URL, leaving only the actual address of the shared library. Within a few seconds, a list of the songs in that library appeared. I located a song that I already owned, clicked Download, and the program downloaded the song, storing it on my hard drive, where I could add it to my own iTunes music library. In its current, embryonic form, iSlurp is the lesser of the two programs. Browsing is cumbersome, for example -- iSlurp doesn't list artists, albums, and genres in sortable columns. iTunesDL provides a much nicer interface, including a Search box. If their developers manage to avoid courtrooms, programs like iTunesDL and iSlurp will turn iTunes into a powerful, peer-to-peer music swapping platform. Will recording industry lawyers be able to shut down this kind of back-door swapping? It seems unlikely. Unlike overt file-stealing services such as LimeWire, iTunesDL and iSlurp don't rely on users explicitly making their music available for download. These programs simply take advantage of the fact that users have activated iTunes' sharing feature -- a feature that is intended for streaming, not downloading. Thus, users aren't doing anything wrong when they make their music available -- even though some people may be stealing it, not streaming it. Something tells me this isn't what Apple had in mind. Note: The original version of the above covered only iSlurp. Shortly after I posted it, a reader emailed me to tell me about iTunesDL, which I'd somehow not heard of. I then updated the post accordingly. One more thing. In reporting on iTunesDL and iSlurp, I'm not advocating music theft. Stealing from an artist is wrong, not to mention a bit twisted. Sharing your iTunes library on the Internet? There's another way to publicize it. Ben Cheng has just launched iTuneShare. Like the ShareiTunes site I mentioned last week, iTuneShare lets you tell the world that you're sharing your music. But iTuneShare goes a couple of steps further: it lets you bookmark your favorite shared libraries, search by bitrate (handy if you have a slower connection), and search by location. iTuneShare is brand-new, and still has that new-site smell. But Ben is eager to spread the word and is seeking feedback. Check it out, and remember, you can write to me with questions or comments, which I'll address here. On Apple's iTunes discussion boards, some people have asked about converting an existing MP3 music library to AAC format. Many users want to take advantage of AAC's audio-compression efficiencies to free up disk space on their Macs and their iPods. It's an understandable goal, and iTunes makes it easy. But if you don't do it right, your music will suffer. AAC is also a lossy format, and when an MP3 file is compressed with AAC, the lossiness is compounded. How much will your music suffer? That depends on the bitrate at which it was originally encoded and the bitrate at which you re-encode it. A high-quality (say, 256kbps) MP3 encoded into AAC at 192kbps may compress reasonably well. A 128kbps MP3 probably won't, and the resulting AAC file may have a swirly, shortwave-radio quality to it. Bottom line: If you want to take advantage of AAC's space savings, you'll get better results if you re-rip your original CDs instead of recompressing your existing MP3s. iTunes has some smarts that make this re-ripping a little less laborious: If you re-rip a CD that iTunes already has in its library, iTunes tells you that the songs have already imported and asks if you want to import them again. Simply click the Replace Existing button. Thus, you don't have to rebuild your playlists, retype any song information, or even manually delete your old MP3s. Oh, and when might you want to use iTunes to simply convert your existing MP3s? I'll have that answer in a future tip. Hosts of computer radio shows continue to make the mistake of thinking that I'd make a good guest. I've been on a couple of shows recently, and archives of those programs are now available. Having trouble sleeping? Take a listen. Digital Village, May 3. Hosts Ric Allan and Doran Barons grill yours truly and Bob LeVitus about the new iTunes 4 and more. Listen with RealPlayer. Your Mac Life, April 23. Host Shawn King and I chat about iLife and about "The Macintosh iLife" book/DVD. Download an MP3 or stream the archive using QuickTime. I always have fun doing radio and TV. On many Wednesdays, I co-host Point & Click Radio, a weekly show that airs on Mendocino County Public Broadcasting. A reader writes with an iMovie 3 question: "When I try to do a zoom with Ken Burns I always have problems with chattering, aliasing and a bouncing of the picture, almost like the earthquake effect in iMovie. I am using photos that were recorded in the high end of the resolution scale on my camera. I have tried slowing the speed way down, and a small zoom, still with the same problem. No matter what I try the process does not work for me. Any ideas?" I've seen this problem sometimes myself. An Apple representative acknowledged that other users have reported some shakiness, and says the company is "looking into refining the feature even more." In the meantime, you might try one of the third-party pan/zoom add-ons that are available for iMovie. I write about these on page 129 of "The Macintosh iLife." My favorite is LQ Graphics' Photo to Movie, which not only provides smoother moves than does Ken Burns, it also provides "ease-in" and "ease-out" features that make pans and zooms less jarring. Highly recommended. iTunes 4 is best known for its music store, but the new version also promises to have a profound effect on Internet radio. I'm referring to the music sharing feature, which enables you to share part or all of your music library so that other iTunes users around the world can tune in and listen. I've written about iTunes music sharing in previous posts. But there's a new trend to report: the birth of Web sites that act as iTunes listening portals -- jumping-off points for exploring other users' shared music. One such site is ShareiTunes. This site goes beyond the ServerStore program I mentioned a few days ago by adding intelligence: before listing a shared music library, the site checks to verify that the library is still out there and available for listening. That way, you don't get a lot of "not responding" error messages because someone turned off music sharing or simply shut down at the end of the day. When I look at a site like ShareiTunes, I see a new kind of Internet radio: a peer-to-peer Internet radio where ordinary music lovers make their music available simply because they want others to enjoy it. No profit motive, no (probably unrealistic) business model. Just someone saying, "I love this music -- maybe you will, too." Personal Internet radio has already been available for some time. The geek-inclined can set up Shoutcast servers on their systems or Apple's own QuickTime Streaming Server. And if you're willing to pay $10US or more per month, you can have your own Internet radio station on Live365. But, speaking of unrealistic business models, Live365 inserts commercials into your stream every now and then. iTunes music sharing eliminates these technical and financial hurdles. Want a radio station? Click a check box. How does the record industry plan to extract royalty payments from us iTunes users? It can't. Just like that, iTunes 4 has changed the rules of the game. Of course, iTunes 4 is minor-league streaming. You can't have more than five simultaneous listeners, for example. But what iTunes lacks in punch, it makes up for in numbers. Thousands -- soon, millions -- of people now have the ability to run their own personal Internet radio stations. Imagine that: millions of people sharing tens of millions of songs. Not because they need something to play in between commercials. Not because they're trying to sell you CDs. Not because they want to steal from their favorite artists. But simply because they love their music, and they're thinking maybe you will, too. While Apple touts its well-deserved success with the iTunes Music Store, there are developments elsewhere in the iLife world. Virtix, makers of some extremely cool effects add-ons for iMovie and other video-editing packages, has just added another. The company's iBubble greatly enhances iMovie's text-titling features. With iBubble, you can position a text title anywhere within the video frame. You can also -- and here's where the funky name originates -- create cartoonist-like speech bubbles and thought bubbles, as shown here. So while those 472 songs you bought are downloading, check out iBubble and the rest of Virtix's product line. And stay tuned to this channel for reports on the new iPods, much more on iTunes 4 and its music store, and more. When you go into a store, chances are you don't just buy one thing. Most of the time, you grab a shopping cart so you can haul all of your purchases to the cashier at once. It's true that one of the beauties of the iTunes Music Store is that you can buy a song and begin downloading it with just a click or two. But iTunes 4 also provides a shopping cart, and it's a better way to shop when you're picking up several songs. In its shopping cart mode, iTunes doesn't download each purchased song immediately. Instead, it slings them into a shopping cart. When you're ready to check out, a couple of clicks buys the songs and begins their download. Shopping for multiple tunes is more convenient in shopping cart mode. Browsing the music store is faster, too, since iTunes isn't download a song in the background while you shop. To use iTunes' shopping cart mode, choose Preferences from the iTunes menu, click Store, and then click the option labeled Buy Using a Shopping Cart. You'll notice the Buy Song button that appears next to each song now reads Add Song: click it to add a song to your cart. To buy the songs in your cart, click the Shopping Cart item in the iTunes source list, then click the Buy Now button near the lower-right corner of the iTunes window. I'm spending entirely too much money. Increase the buffer size. A larger streaming buffer yields more-reliable playback, particularly with music encoded at high bitrates and with slower connections. Choose Preferences from the iTunes menu, click Advanced, and choose Large from the Streaming Buffer Size pop-up menu. Display the Bit Rate column. iTunes can display the bit rate for a song: just point to a column heading in the iTunes window, press the Control key, and choose Bit Rate from the shortcut menu that appears. To sort the music library by bit rate, click the Bit Rate column heading. Now you can quickly spot the tunes that are most likely to play, given the speed of your Internet connection. Remember, Your Mileage May Vary. Other factors can result in interrupted playback: the connection speed of the user who's doing the sharing, Internet congestion, and more. But following the tips above will help improve reliability. Another one of the magnificent new features in iTunes 4 is the ability to share your music library with other computers on a network or with other people on the Internet. No, this isn't Napster-style sharing: Shared songs are delivered via streaming -- you can't download them to your hard drive. One of the very best things about iTunes music sharing is that you can "publish" your music library -- or just selected songs or playlists -- so that other users can listen in. It's a fun way to share your musical tastes with people in your neighborhood or elsewhere on the planet. iTunes is great at finding shared music libraries elsewhere on your network. But how can you find libraries over the Internet? That's where the cool tool comes in: a little freeware program named ServerStore allows you to view a list of publicly shared iTunes libraries. In my tests, some of the libraries weren't accessible, but many were. Seeing other users' music libraries and playlists appear in my own iTunes window was a real kick. One of the jillion things I've always liked about the iPod is its ability to be upgraded. Each time Apple has added significant features to its new iPods -- the ability to store contact and calendar information, for example -- it has released a software updater that adds the identical capabilities to older models, too. Alas, this parity has come to an end. The newest iPods -- the ones Steve Jobs unveiled last week -- have capabilities that aren't available to older iPods, not even after you install the iPod 1.3 updater. Apple has documented the differences between iPod software 1.3 and 2.0 in a Knowledge Base article named iPod 2.0 and 1.3: Software Version Comparison. Time to buy a new iPod? Maybe not. The 1.3 updater adds the ability to play AAC audio files purchased from the iTunes Music Store. Only a few of the features in iPod software 2.0 (used by the newest iPods) have anything to do with music. So if your iPod primarily does duty as a music machine, don't feel obligated to run out and replace it. I'll be getting a new iPod soon -- check back next week for reports. And remember, you can write to me with questions and comments that I'll address here. So I'm back at the local Kinko's, downloading QuickTime 6.2 and iPod Updater 1.3 before heading back to my slow, on-the-road modem connection. Next to me here at Kinko's is a gentleman with a PowerBook G4. And what's he doing while he waits for his documents to print? Downloading tunes via LimeWire. It's ironic and maybe a bit telling: while I download software that will allow me to buy music, someone next to me is stealing it. MyMac.com Reviews "The Macintosh iLife"
I've always liked Tim Robertson's informative MyMac.com site, which has been publishing about the Mac since 1995. MyMac.com has published a review of my book/DVD, "The Macintosh iLife." Reviewer David Weeks gives the book/DVD five MacMice out of 5, and calls it "a screaming deal." I couldn't agree more, but it's nice to see it nonetheless. My thanks to David and Tim and MyMac.com!